Use this image for the following problem. What is the perimeter of the square in this picture? The question only is looking for a part of the picture, just the square. With squares, the rule is that all the sides are equivalent, meaning the same lengths and all angles are right angles. Perimeter means adding up all the sides together. So we just need to add the lengths of the sides of the square. Uh oh, we only have one side that is listed. Again, remember that with squares the sides are equivalent, and we know one side is 5 inches. We just need to take because a square has 4 sides. Sandy wants to put a border around her son’s nursery. If all four square walls in the room have the same width and use up feet of border, what is the length of one wall? Now, in order to isolate the variable, we can divide both sides by four. When we solve, we find that the length of each wall is . Find the perimeter of a square with side length 10. A new building in New York City will have a footprint that is a perfect square, taking up a complete city block. If one city block is of a mile, what is the perimeter of the building? To find the perimeter of a square, we need to multiply the side length by 4. Use the following to answer the question. Find the perimeter of the square. where a, b, c, and d are the lengths of each side. 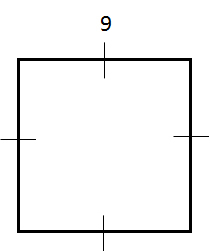 Find the perimeter of a square with a width of 8 inches. You are playing Monopoly and notice that the dice is a cube. If the dice has a height of 2 centimeters, what is the perimeter of one of its surfaces? Begin by realizing that we need to find the perimeter of a square. Next, recall that the height of a cube is the same as its length and width. In other words, one surface of a cube will be a square with sides equal to the height of the cube. Armed with this knowledge, we can find the perimeter of the square. A square stamp has an edge length of 6 centimeters, what is its perimeter? To find the perimeter of a square, we simply can multiply the edge length by 4. Find the perimeter of a square that has a base of length 9 inches. where a, b, c, and d are the lengths of each side of the square. Earlham College, Bachelor in Arts, Mathematics. Saint Josephs University, Master of Science, Education.